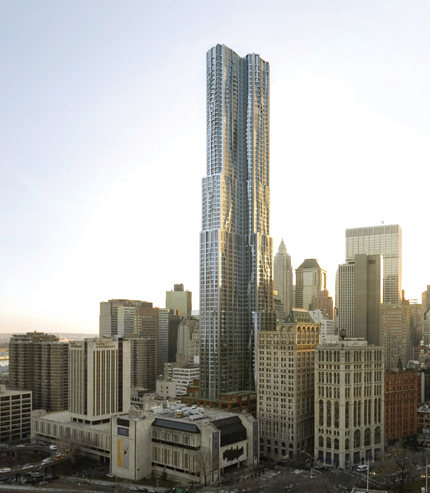 A press conference scheduled in the spring of 2008 to reveal the design by Frank O. Gehry for the 76-story, mixed-use tower being developed near City Hall by Forest City Ratner Companies, a wholly owned subsidiary of Forest City Enterprises, Inc., was canceled because of the crane collapse on the Upper East Side but then was held anyway. The design of the 867-foot-high tower still retains a stainless-steel façade for its upper 71 floors as has been indicated for the past year or so, but the façade treatment is significantly different. The prior design indicated that there would be small setbacks on every floor in a symmetrical, stairway-to-heaven fashion. The new design, however, is asymmetrical and marked by jutting curves in a tortured and twisted aesthetic that imparts an energetic, almost fraying look. 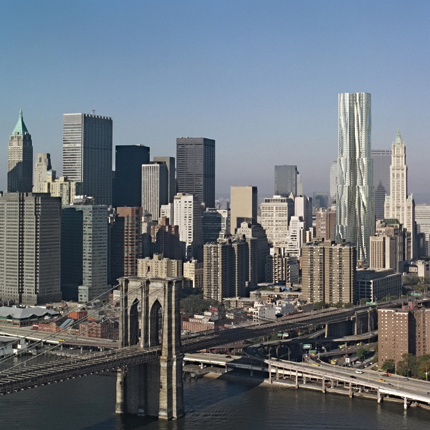 The stainless-steel cladding, of course, will still make the tower the most glistening in Lower Manhattan. The building will have 903 market-rate apartments on floors 7 through 76. The low-rise base of the building, however, which will contain a 100,000-square-foot, 630-student school on the first four floors, and 21,000 square feet of medical offices on the fifth floor, is clad in red masonry. The building will have 1,300 square feet of ground-floor retail and 175 parking spaces below grade for the adjacent New York Downtown Hospital. 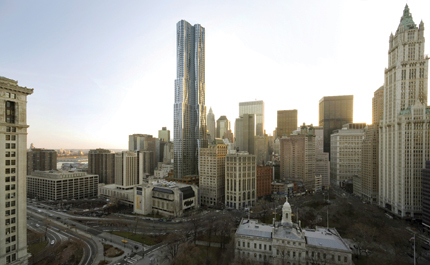 The mid-block tower is on the block bounded by Beekman Street to the south, Spruce Street to the north and William Street to the west. The lower levels of the tower are expected to be ready for occupancy in late 2010 and the remainder the next year. Studio apartments will have about 500 square feet, one-bedrooms will have about 670 square feet, two-bedrooms will have about 1,100 square feet and three-bedroom units will have about 1,600 square feet. The residential section of the tower will have about 20,000 square feet of amenity space including a fitness center, a conference center, a lounge, a sundeck and a children's playroom. Mr. Gehry (see The City Review article on his prior design and The City Review article on a Gehry exhibition) has also designed the planned Atlantic Yards project for Forest City Ratner in Brooklyn and the recently completed IAC headquarters building in West Chelsea. His most famous building is the sinuously curved Solomon R. Guggenheim Museum in Bilbao, Spain. In his May 31, 2008 review of the building in The New York Times, architecture critic Nicolai Ourossoff said that its "crinkled steel skin is proof that the skyscraper has yet to exhaust itself as an urban art form" and "signals that the city is finally emerging from a long period of creative exhaustion." The tower will be taller than the Woolworth Building on the west side of City Hall Park, but shorter than the mixed-use tower being erected by Silverstein Properties at 30 Park Place, just to the west of the Woolworth Building. The changed aesthetics of the new tower are a bit disappointing as it now appears to take on a rather mean and ornery look in comparison to the earlier design that was, in effect, a modern and refined take on the city's famous "wedding cake" zoning of setbacks. Its metallic shimmer, of course, will most likely be quite dazzling and one has to admire Gehry's constant adventurousness. His recent redesign of the controversial Atlantic Yards project for the same developer in Brooklyn was a vast improvement and its jiggered Lego-style boxiness is very stunning. This new design introduces an organic flair that many will find fascinating, of course, even if purists will find it odd and eccentric, but that is not necessarily a bad thing at all for New York.